Jake Silpe left his arm outstretched, still in the shooting motion, for maybe a second longer than usual. Nothing too exaggerated as the Penn senior guard still had to get back on defense to try and stop Saint Joseph’s star Charlie Brown Jr. But just long enough, it seemed, to soak in “one of the biggest shots” of his life—a three-pointer in the final two minutes that helped seal Penn’s 78-70 win over Saint Joseph’s at a nearly-full Palestra on Saturday and clinch a perfect 4-0 Big 5 record for the 2018-19 Quakers. Saturday’s victory was especially gratifying for Silpe and the rest of the team’s upperclassmen who had, to this point, failed to make their mark in the famed city series that features round-robin games vs. Philadelphia rivals Villanova, Temple, La Salle and St. Joe’s. They weren’t the only ones. Since the start of the 2007-08 season, the Quakers had gone just 6-38 vs. Big 5 opponents. They had won the same number of Big 5 games (four) in the previous four seasons combined as they did this season. The last time they won the Big 5 title outright was in 2001-02 when Andy Toole C’03, Ugonna Onyekwe W’03 and Koko Archibong C’03 were running things in the city. Before that, you have to go all the way back to when Ron Haigler C’79 GEd’99 led the Quakers to back-to-back perfect Big 5 seasons in 1972-73 and 1973-74. Silpe—who’s developed into Penn’s most important player off the bench—certainly rose to the occasion in his final two Big 5 games, hitting huge threes against the Hawks and in a 77-70 upset of Temple the previous week. A month earlier, fifth-year senior Antonio Woods poured in 16 points to fuel Penn’s even bigger 78-75 upset of defending national champion Villanova at the Palestra—three days after leading the Quakers to an 83-65 thumping of La Salle in their Big 5 opener. The theme of not getting enough respect from Big 5 opponents has been in their heads a lot. Donahue brought it up after Penn’s win over Temple, saying that he didn’t know if the other four Philly teams “feel threatened by Penn Basketball.” And then after beating St. Joe’s, he pointed to a recently made Big 5 documentary in which some people interviewed seemed to be dismissive of Penn. “We got tired of feeling like we’re not really a part of it,” the coach said. It makes sense, in some ways, why a team from the non-scholarship Ivy League might sometimes be an afterthought in the Big 5, at least as the Quakers have struggled for much of the past decade. Villanova has won two of the last three national championships; Temple ranks in the top five all-time in Division I wins; St. Joe’s and La Salle also boast illustrious basketball histories with exciting NCAA Tournament runs this century for each. Penn, of course, has a rich hoops tradition too, particularly in the 1970s when the Quakers were a dominant force in the Big 5. 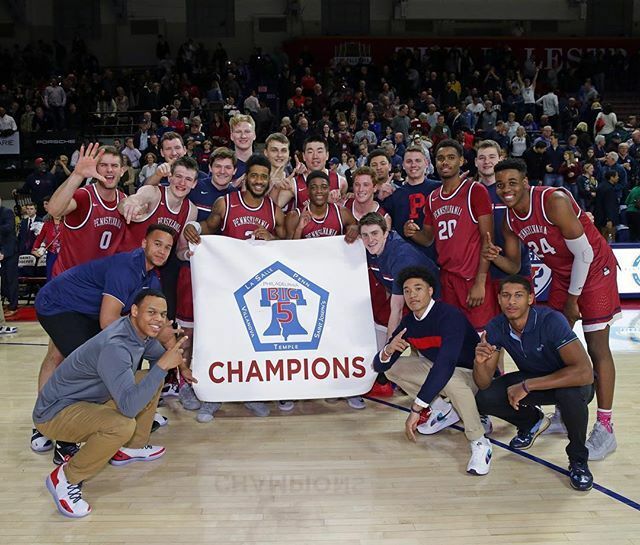 And so, on top of reclaiming its place as a perennial Ivy League powerhouse (which Penn took a step toward with its first championship in 11 years last March), this year’s team also made it a mission to restore its place in the Philly hierarchy. There were no trophies after Saturday’s win. Fans did not rush the floor. Nets were not cut down. And all roads still go through the Ivies, where Penn has work to do after an 0-2 start, to make the NCAA Tournament. But the Big 5 has always been as much about bragging rights as anything else. And until next season begins, the Quakers can finally tell everyone that they have those again.